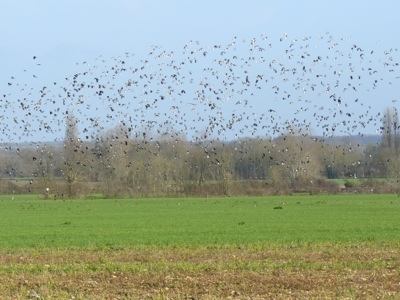 Spring is my favourtie time of year (often making me feel bubbly and silly inside) and although I can’t decide what my favourite spring thing is, one of them has to be the moving and arrival of the migrating birds. One of the most spectacular sights to see as they often move in great numbers is the migration of Storks, Cranes and Geese that fly overhead in early spring. Having spent their winter in Spain they are making their way back to Scandinavia and the Baltic for the summer. As they are calling/'clapping' to each other all the way I often hear them before seeing them. I have also been known to dart off the main road and head down a track to get a better glimpse, such is my excitement at witnessing this spectacle. 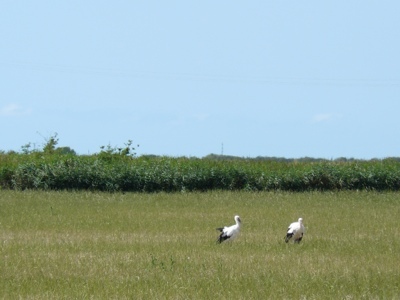 I will admit I am not an expert on their habits, so not sure why, but some seem to enjoy the Charente-Maritime summer so much they nest in the marshland around Brouage. Whatever the reason, I certainly enjoyed watching them when I cycled around the marshes last year. 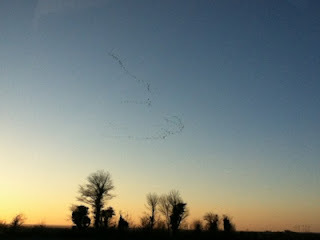 As winter is beginning to turn I often see the Northern Lapwings, part of the plover family, while out walking the dog. They enjoy moist habitats, so the open fields surrounding the village that are prone to flooding provide a perfect winter location. Prior to heading back to Scandinavia and Russia they congregate in large groups and can be very noisy, but are quite a sight en masse. Possibly the most exotic looking visitor is the Hoopoe who is found year round in Africa but some migrate north to breed in the summer. They like dry habitats especially orchards, vineyards and olive groves and are also quite happy in gardens. Feasting on insects, but also small mammals and reptiles, their long probing beaks are ideal for ground foraging. Nesting is often low to the ground and in holes in walls, so the old stone walls of the barns around here, combined with the orchards and vineyards make it a popular breeding area for them. I will admit they are a beautiful sight to see, but as they are very shy it is more common to hear them rather than see them and I’m quite happy with that. 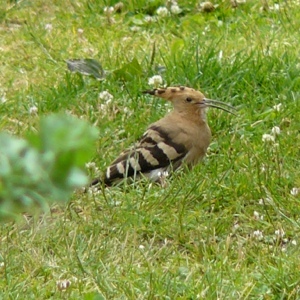 To sit in a quiet spot in the garden and listen to the rhythmic call of the hoopoe is almost hypnotic. 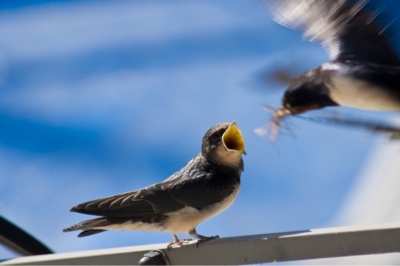 My favourite summer visitors are the Swallows, with the first one usually arriving from Africa in mid March. Their arrival is so important I note the first sighting in the calendar every year. They spend their summers here, nest building in the barn, breeding and teaching the youngsters to swoop and fly – often dive bombing the cat and dog as they walk across the courtyard. Feasting on the flies they are perfect for keeping the fly population down, another reason I am glad to have them. 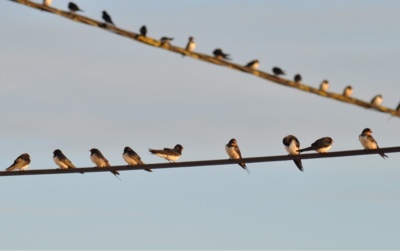 Their happy chattering sound is lovely to hear so it is sad when they all congregate on the telephone and power lines in September getting ready to depart for a warmer winter (not that I can blame them). However, I am pleased to announce that I have seen and heard all of these visitors this spring, so all is well with my world. Living in the middle of nowhere may not be for everyone, but when I get to see and hear sights like these I am very happy. What fun to notice the exotic birds making their way north. Thanks for sharing. Thanks Paula, they are a lovely sight.